But the Lord answered: “Martha, Martha,” he said “you worry and fret about so many things, and yet few are needed, indeed only one. It is Mary who has chosen the better part; it is not to be taken from her” (Luke 10:41–42, JB). 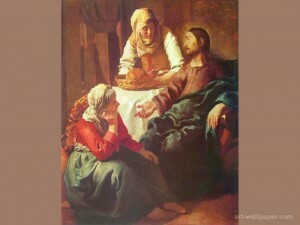 In this passage from scripture we find Martha’s sister, Mary, sitting at the feet of Jesus while Martha is doing all the fretting and serving. Our human activities can be necessary, but few are needed; and they are always inferior to God. Jesus is the Better Part. Jesus is telling us that we will only find peace if choose the Better Part, by placing Him as number one in our lives. Worry comes easily to me as I imagine it does to many. We do tend to worry and fret about many things. I am well aware that I am only sustained by the constant help of God. As long as I don’t rebel, which I unfortunately do to my own detriment at times, I am fine. Thank God for the Sacrament of Penance, also known as “confession,” to help me back on my feet. It is only when I choose to push God aside that I get into trouble. Some of the worries that crossed my mind after my diagnosis of cancer were: How will my family be provided for if I die? How will my wife, Kathleen, manage the family without me? Though Kathleen is a wonderful, faith-filled leader, she needs my help; how will she keep our children on the narrow road of faith and virtue in this challenging culture? How will my family be protected? How will my work of evangelization be accomplished? What will become of my small business? The answer to these questions, fears, and doubts, as always, was to trust in Jesus. It is easy to trust in Him when everything is going our way, but the pedal meets the metal when we receive a challenging cross like cancer in our lives. As I prayed about this, I came to the hard-to-accept, yet encouraging and true, reminder that God does not need me to accomplish any of these things. Don’t misunderstand—we each have a mission and responsibilities that God has given us to fulfill, and we must do our best to accomplish them, but only for as long as God decides. By the way, our irreplaceable mission in life can only be achieved by ourselves—no one else; so we do have a serious obligation to put our talents to work for God’s glory while we have the gift of life here on earth. I am currently gifted with the privilege of leading and serving my family. God most certainly has the power to take care of my family in His special, mysterious, and providential way even better without me, if He so chooses. I know that whatever He chooses will be the best. I do want to go on living to care for my family and enjoy the beautiful gift of life, but this is outside of my control. It is in God’s control! He can accomplish the work of caring for my family and evangelization without me. My only responsibility is to be true to my call to work at my mission while I am alive and able. That is my piece of His puzzle. Others have their piece. They will complete their part of the puzzle with their mission and work. After all, it is all God’s work (2 Corinthians 5:18, JB). So the answer is to abandon myself into God’s trustworthy hands, to embrace God’s most perfect plan for me and my family, with confidence and trust that all will work out for the best. Sometimes, on a human level, I am tempted to tell God that my family needs me, so please heal me ASAP. But I then need to, and do, return to the prayer, Father…if you are willing, take this cup away from me. Nevertheless, let you will be done, not mine (Luke 22:42–43, JB). You, God, are all-knowing and know best, not me. We will only find peace when we abandon ourselves with complete trust into the loving arms of our caring Father. This is an excerpt from Healed Through Cancer and Other Adversities, soon to be published. In this book James Littleton, age fifty-three, happily married father of nineteen children, shares, both pragmatically and spiritually, his fascinating, self-reflective, and inspirational journey with cancer (Chronic Lymphocytic Leukemia) from diagnosis through numerous courses of chemotherapy and an eventual stem-cell (bone marrow) transplant. Besides the obvious difficulties involved, he writes of the many forms of healing that actually arise out of cancer and other serious adversities. In these pages the reader will find much consolation, encouragement, helpful insights, increased hope, faith, and fortitude, as well as some useful resolutions. This book is intended for all people of any and all religious backgrounds and beliefs. The author points to the Merciful Divine Physician who is the One who heals in diverse and mysterious ways.